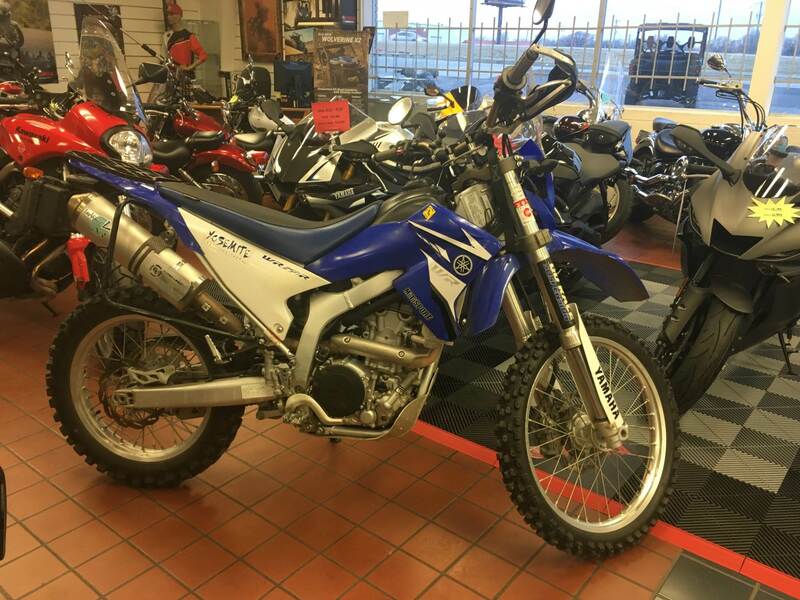 This used unit comes with a lot of upgrades, including a Revlock auto-clutch, racks, guards, windscreen, accessory box (attached to plate), suspension upgrade by GoRace, LeoVince pipe, and a power commander. One of a kind and worth stopping by! CHOOSE YOUR PATH This supermoto-inspired bike built for riders who spend more time off-road than on the street. 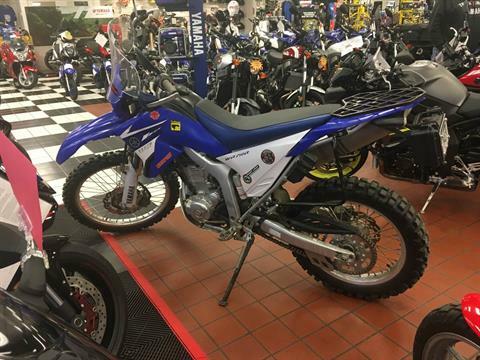 Directly descended from our YZ and WR off-road machines, the WR250R makes Yamaha's off-road prowess street accessible. Narrow, YZ-inspired seat features gripper-type cover for great seat-of-the-pants feel. Seat height is 35.2 inches. WR enduro-style instrument panel provides excellent visibility in spite of the compact size. Basic mode provides speed, clock, tripmeter and self-diagnostic function. Measurement mode includes stopwatch, distance-compensating tripmeter, etc. Minimalist front and rear fenders are designed for function, simplicity and lightness. Bodywork with separate radiator heat outlet helps keep engine and rider cool. Separate clutch cover means easier serviceability. 17-inch wheels mount radial street rubber in 110 front and 140 mm rear widths and help lower the seat approximately 1.4 inch compared to the WR250R. One-tooth smaller rear sprocket (13/42) works with the smaller-diameter tires to bring out the WR250X’s strong-accelerating character. Stiffer springs front and rear and street-oriented damping settings reduce pitch compared to the WR250R for excellent pavement performance. 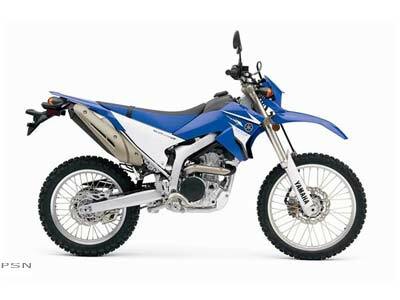 YZ/WR250-inspired semi-double-cradle frame uses a main frame of cast and forged aluminum sections, with high-strength steel downtube for excellent strength and rigidity characteristics. Asymmetrical swingarm provides excellent strength/rigidity balance and a dynamic look. Cast aluminum crossmembers, extruded arms and a 22 mm rear axle are carefully tuned for optimum handling. Fully adjustable 46 mm fork provides 10.6 inches of wheel travel. A forged lower triple clamp and a cast upper one help give outstanding front-end feel. An aluminum steering stem reduces weight. Linkage-mounted rear shock provides 10.4 inches of travel with adjusters for compression damping, rebound damping and spring preload-and features a 14 mm rod and 46 mm cylinder for excellent damping and fade resistance. Wave brake rotors front and rear, including a large, 298 mm front disc, reduce unsprung weight and provide excellent performance. Rear pedal is forged aluminum. Fresh-sheet design 250 cc liquid-cooled, DOHC engine with two titanium intake valves and two steel exhausts, forged piston and plated cylinder for outstanding durability. An ECU-controlled EXUP exhaust valve, along with an electronic intake control valve, broadens the powerband. Large titanium intake valves have WPC coating, a surface treatment in which the surface is sprayed with fine powder at over 100 meters per second to increase surface hardness. Direct ignition coil sits atop the spark plug-another first on a Yamaha on/off-road model. Six-speed gearbox provides a wide spread of ratios, with shower-type lubrication for reliability. Special, light-action clutch makes shifting a snap. Tucked-in, three-chamber muffler keeps the mass concentration up and the bike quiet. Electric start only: Leaving off the kickstarter keeps it light and simple. Directly descended from our YZ motocrossers and WR off-road machines-even the original Yamaha YA-1 of 1955-the all-new WR250X is here to make Yamaha’s off-road prowess street accessible. Not exactly an enduro, a supermoto or a sportbike, the WR250X is for riders who ride mostly paved surfaces. 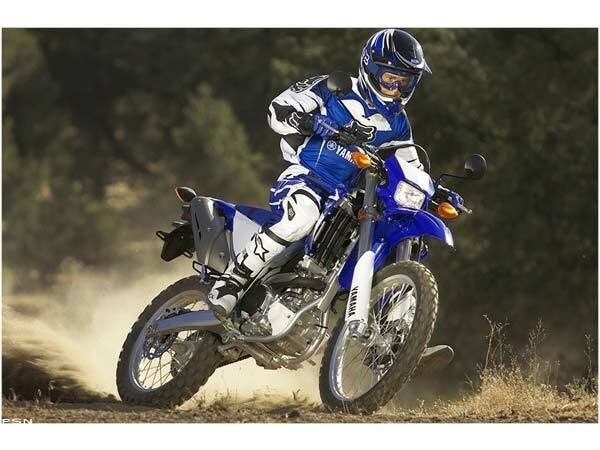 Its sibling, the off-road inspired WR250R, is for riders who spend more time in the dirt.